A Work In Progress: One Middle-Aged Broad's Descent Back Into Horse Madness! 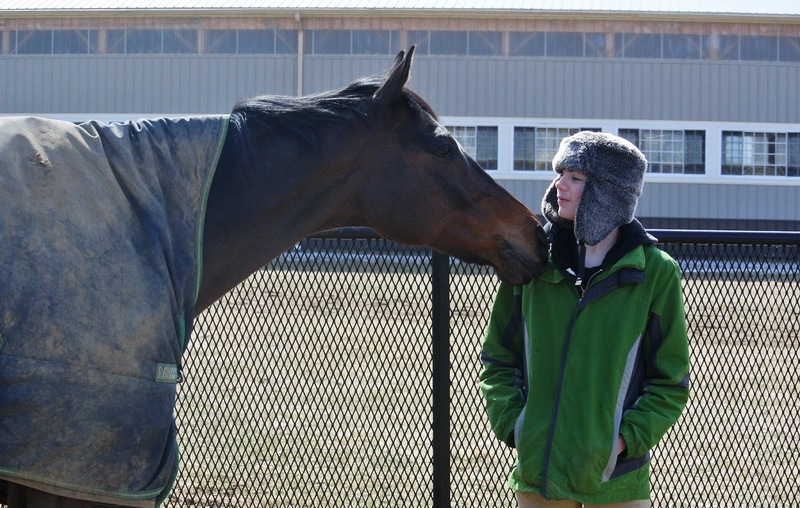 : Horses and Kids: Expensive Therapy or Lasting Legacy of Love? Sophie on Cookie and Noah on Sugar. When I was younger I didn't want kids. Not because I didn't like them. More like I thought I didn't have the right skill sets to be a good parent and I didn't feel it was a good idea to potentially screw up perfectly good little humans. So it came as a bit of a surprise to me that at some point I changed my mind and decided reproduction sounded like a good idea. And a few years later it was even more surprising to me that something I started doing again as a means of gaining some time away from my kids actually turned into one of the best things I could have done for them as a parent. 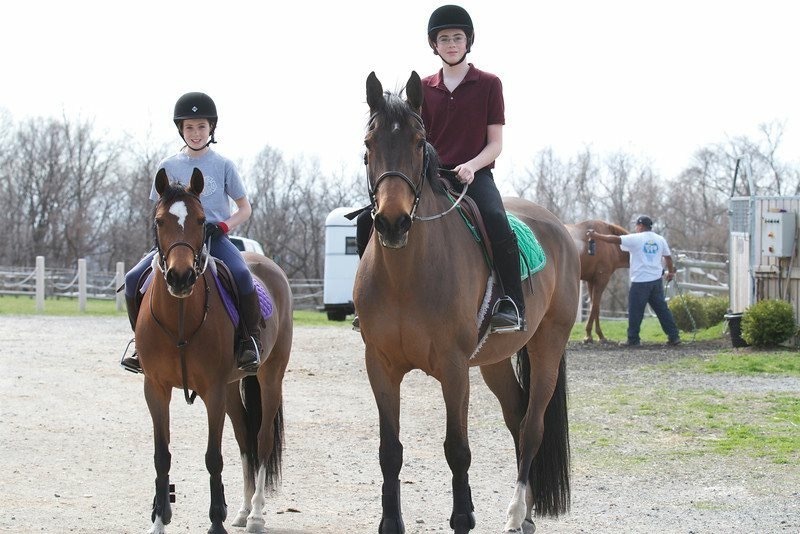 Fast forward a bit to the point where both my kids had begun taking lessons with me and I now had a horse of my own. Mommy-time now had a new meaning. It meant teaching them how to be safe around 1200 lb animals. It meant teaching them how to communicate with the horses and to listen to what the horses were communicating back to them. It meant spending hours commuting back and forth to the barn and then hours at the barn together, which meant we had a lot of time to talk to each other, laugh with each other, sing together, or just 'Be' together. With the kids' other sports I dropped them off, cheered them on, picked them up and then brought them home again. Sure, we talked about the soccer practice, or the lacrosse game, or what the coach had said, but with the kids' sports my husband and I were largely onlookers. 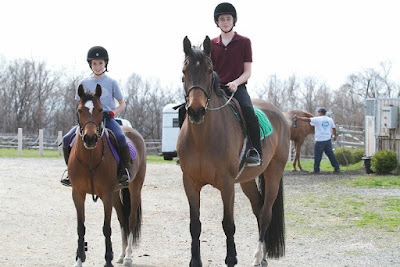 The riding was something the kids and I did as a unit. My son started his freshman year at college this past Fall. Like any other mother, I worried that he'd be overwhelmed, that he would have a hard time adjusting and making friends, that he'd have a hard time without the safety net of family and friends. I shouldn't have worried so much. 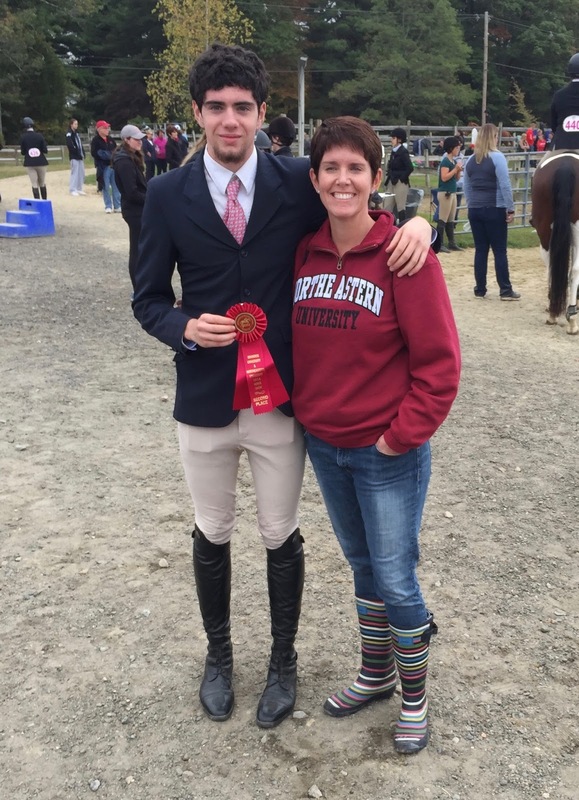 Shortly after school started Noah called home and told me he tried out for and made the Northeastern University Equestrian team. 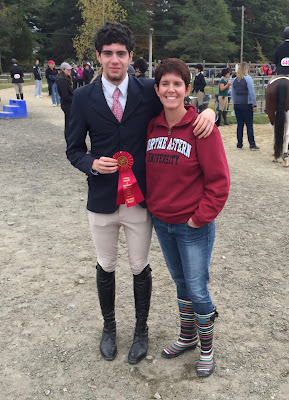 Over the course of the first semester he told me several times how spending time with the horses helped him deal with the challenges of being away from home and being a first-year engineering student. He'd call home and tell me about his lessons on the team horses, or send texts with pics of the horses he'd ridden at shows. When he was home on break recently we were having a quiet breakfast together and he told me again how much the riding had been his anchor while adjusting to his new life. The he told me, "I think I'm going to be like you. 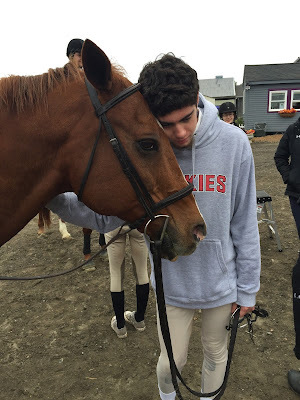 I think I'm going to always need the horses in my life." A lot of being a parent is just bobbing and weaving and hoping you've done more to build them up than screw them up. I may have spent the gross national product of Kenya for several years running, but after hearing what his experiences with horses meant to my kid, well, it pretty much made it all worthwhile. One of the greatest gifts my parents gave me was to allow and support my pursuit of insanity, or rather horses. Love this post, it made me thing of all the things they did for me, ways they supported me, and memories we share despite their un-horsiness. Love your kids' perspectives - nothing better for keeping out of trouble than good ol' barn time responsibilities!